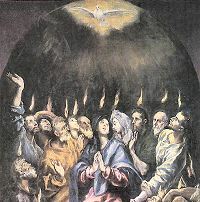 The novena of the Holy Spirit is the chief of all the novenas, because it was the first that was ever celebrated, and that by the holy apostles and the most holy Mary in the supper room, being distinguished by so many remarkable wonders and gifts; principally by the gift of the same Holy Spirit, a gift merited for us by the passion of Jesus Christ Himself. Jesus Himself made this known to us when He said to His disciples that if He did not die He could not send us the Holy Ghost. We know well by faith that the Holy Spirit is the love that the Father and the Eternal Word bear one to the other; and therefore the gift of love which the Lord infuses into our souls, and which is the greatest of all gifts is particularly attributed to the Holy Ghost. As St. Paul says, "The charity of God is poured forth in our hearts by the Holy Spirit Who is given to us" (Rom 5:5). In this novena, therefore, we must consider, above all, the great value of divine love, in order that we may desire to obtain it, and endeavor, by devout exercises, and especially by prayer, to be made partakes of it, since God has promised it to him who asks for it with humility: "Your Father from heaven will give the good Spirit to them that ask Him" (from My Prayer Book, by Father F. X. Lasance). Come, O Holy Ghost, the Lord and Lifegiver; take up Thy dwelling within my soul, and make of it Thy sacred temple. Make me live by grace as an adopted son of God. Pervade all the energies of my soul, and create in me a fountain of living water springing up into life everlasting. Our Father, Hail Mary, Glory be, etc. Come, O Spirit of Wisdom, and reveal to my soul the mysteries of heavenly things, their exceeding greatness, and power, and beauty. Teach me to love them above and beyond all the passing joys and satisfactions of earth. Show me the way by which I may be able to attain to them and possess them, and hold them hereafter, my own forever. Our Father, Hail Mary, Glory be, etc. Come, O Spirit of Understanding, and enlighten our minds, that we may know and believe all the mysteries of salvation, and may merit at last to see the eternal light in Thy light; and in the light of glory to have the clear vision of Thee and the Father and the Son. Our Father, Hail Mary, Glory be, etc. Come, O Spirit of Counsel, help and guide me in all my ways, that I may always do Thy holy will. Incline my heart to that which is good, turn it away from all that is evil, and direct me by the path of Thy Commandments to the goal of eternal life for which I long. Our Father, Hail Mary, Glory be, etc. Come, O Spirit of Fortitude, and give fortitude to our souls. Make our hearts strong in all trials and in all distress, pouring forth abundantly into them the gifts of strength, that we may be able to resist the attacks of the devil. Our Father, Hail Mary, Glory be, etc. Come, O Spirit of Knowledge and make us understand and despise the emptiness and nothingness of the world. Give us grace to use the world only for Thy glory and the salvation of They creatures. May we always be very faithful in putting Thy rewards before every earthly gift. Our Father, Hail Mary, Glory be, etc. Come, O Spirit of Piety, possess my heart; incline it to a true faith in Thee, to a holy love of Thee, my God, that with my whole soul I may seek Thee, and find Thee my best, my truest joy. Our Father, Hail Mary, Glory be, etc. Come, O Spirit of holy Fear, penetrate my inmost heart, that I may set Thee, my Lord and God, before my face forever; and shun off things that can offend Thee, so that I may be made worthy to appear before the pure eyes of Thy divine Majesty in the heaven of heavens, where Thou livest and reignest in the unity of the Ever-blessed Trinity, God, world without end. Our Father, Hail Mary, Glory be, etc.